Venice…where do I even begin? Pictures of this city’s narrow canals, its slow-moving gondolas, lavish masks from the annual carnival, and medieval history have fascinated me for over a decade. So, when I had the opportunity to visit the city – even just for a day – a couldn’t say no. From talking with others, I have found that people often have 2 opinions about the city: they love it OR believe it’s not always worth the visit. I fall into the former category. I knew before travelling to the city that I would be visiting a tourist hotspot. But, the promise of the sights I would see completely overshadowed the physical and mental effort that could come along with coping with massive crowds (in case you’re wondering, I visited Venice on an overcast weekday in April, and yes, there were crowds, but all was fine. I loved every moment of my day there). That being said, as a tourist hotspot, Venice is also an expensive city to visit. Though I was in the city for a short period of time, I hope to give you a list of sights worth seeing/things worth doing and tips for saving more than a couple of euros…and yes, this includes going on a coveted gondola ride for a more reasonable price (scroll to the bottom if this interests you). I travelled to Venice from Turin by train (and vice versa at the end of the day). Since the journey would take over four hours (I was travelling from one side of Italy to the other), I grabbed the earliest train possible at the lovely time of 6.00 am (fortunately, I had the opportunity to sleep on the train). The train took me right to the main station in the city, Venezia S. Lucia, so I saved time and money by skipping having to take a water taxi from mainland Venice (the Venice we dream of is located on a series of islands). After arriving in Venice, my goal was to embark on a photography binge while meandering through the windy, tiny streets and dreamy canals (for this trip, I borrowed a friends camera with a wider-angle lens. The camera and lens gave a unique and lovely vintage feel to many of the photos). My goal was to wander in the direction of St. Mark’s square. Eventually, I succeeded reaching my destination, but I was fortunate that I didn’t have a tight schedule since I did get lost in the maze of city streets once or twice. Alternatively, one can reach St. Mark’s square by walking down Venice’s main shopping streets from Venezia S. Lucia (this includes Strada Nuova, Salizada S. Giovanni Grisostomo and Camp S. Bortolomio). However, if you prefer smaller crowds, the smaller side-streets may be the way to go. Overall, walking across the main island of Venice is entirely possible. Not only do you get to see some stunning views and quiet canals, but you get to save on water taxi fares. Moving away from general tips, here are some specific sights to see and things to do while in Venice (please note, that this is based off of things I did during my short stay, so this is not a comprehensive list). St. Mark’s Square, Piazza San Marco in Italian, is the main and only “piazza” in the city (all other squares are much smaller and are called “campi”). 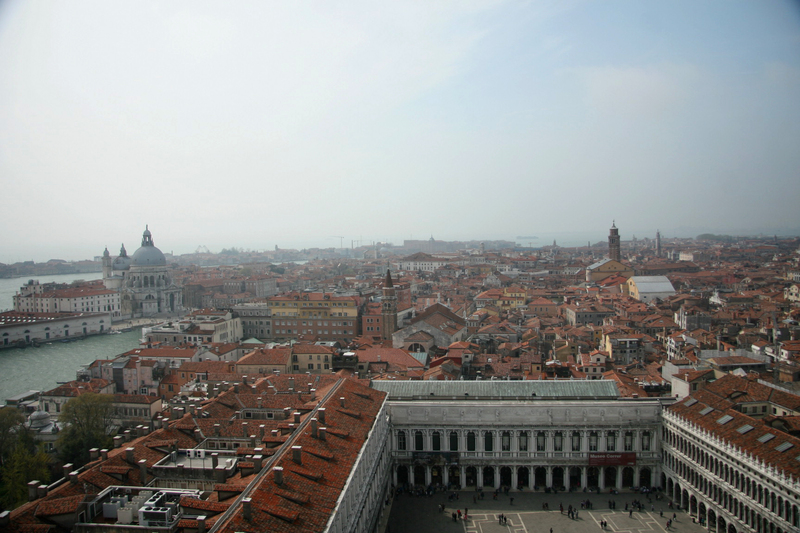 It is usually packed, but from this square, you can access and admire St. Mark’s Basilica and the Doge’s Palace. Please note that even though I mentioned crowds, they are incapable of obstructing the view of the magnificent and towering architecture surrounding the square. At the far end of the Piazza, nearly past the basilica, you can find the Piazzetta di San Marco where you can see the Grand Canal connect with the sea. It’s a fantastic spot for taking incredible photos (see post cover photo). The history of the Piazza goes back over 1,000 years, and it has high religious and political significance. It’s free to visit and definitely worth the visit. St. Mark’s Square featuring St. Mark’s Basilica in the far centre and St. Mark’s Campanile on the right. Found in and impossible to miss in St Mark’s Square, the basilica is the most famous cathedral church in Venice. Due to the city’s close trading relationship with Constantinople (present-day Istanbul) during the middle ages (including the time when church was being constructed) there is a lot of Byzantine influence on the basilica’s architectural style . Expect the basilica to be more ornate (and therefore, unique) than other Catholic cathedrals you may have seen. It’s outstanding. There may be a line to enter, but visiting the basilica is free. Since I love taking photos, I’m always on the hunt for fantastic views of the places I visit. 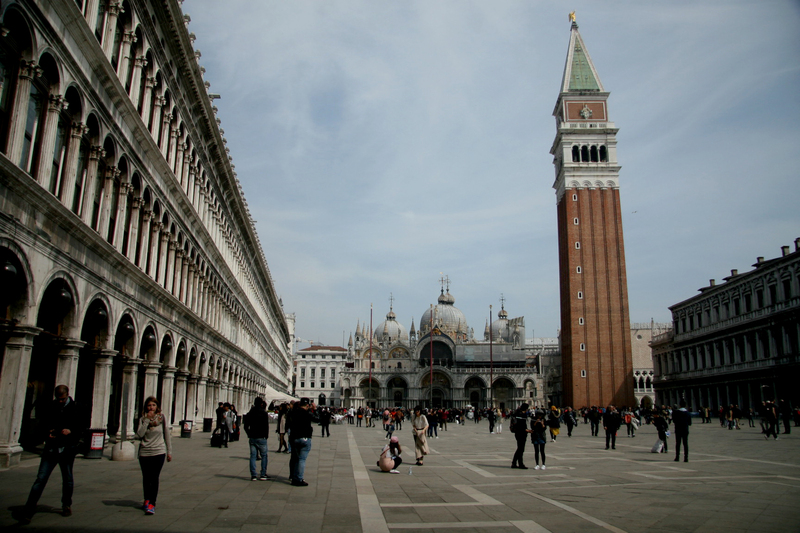 St. Mark’s Campanile (bell tower) can be found in….you guessed it: St. Mark’s Square. However, it is not attached to the basilica. For 8 euros, you can take the elevator to the top of the tower and get a bird’s-eye-view of the whole city. If experiencing breath-taking views is also your thing, I highly recommend taking the trip up the tower. Please note that there may be a line to get in. I first heard about this bookshop on Pinterest (I actually like to do quite a bit of my travel planning there). The bookshop is located on the main island, but in a quieter part of the city (away from the main shopping streets and square). 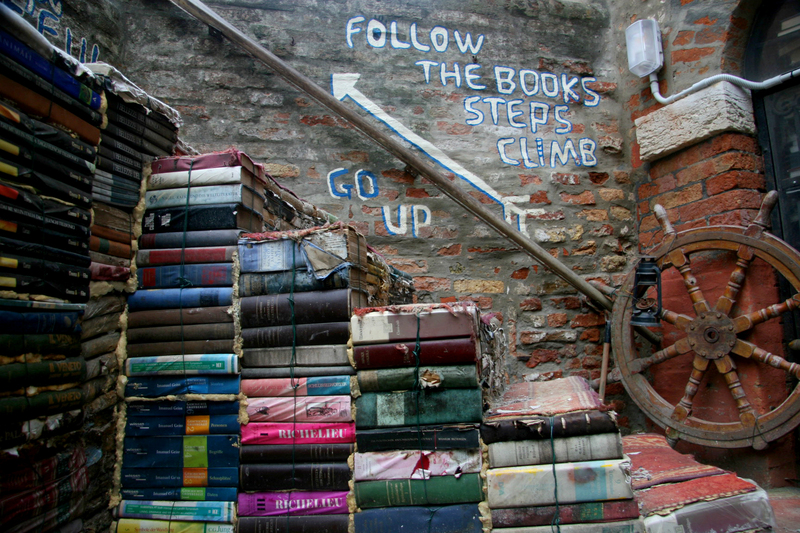 If you walk through the bookshop, at the back, you will find a terrace with a staircase entirely made out of books. You can climb the staircase, and as soon as you do, you get a view of a canal. As a former library-employee that once constructed a throne out of books (yes, yes I really did), this was right up my alley, and completely free. Dining at a restaurant in Venice can be expensive. A great money-saving alternative can be to bring a packed lunch/meal. If packing a meal is not an option, it can still be reasonably affordable to grab something on-the-go from a shop window, such as a slice of pizza. You can take your meal with you and take a seat by the Grand Canal (there are many, many steps available around the Rialto bridge). Here, you can enjoy the view of the canal and secretly smile at the idea that your money-saving strategy has given you a more authentic waterfront dining experience than the ones offered by the pricey waterfront restaurants behind you. Now, I have saved the best for last. 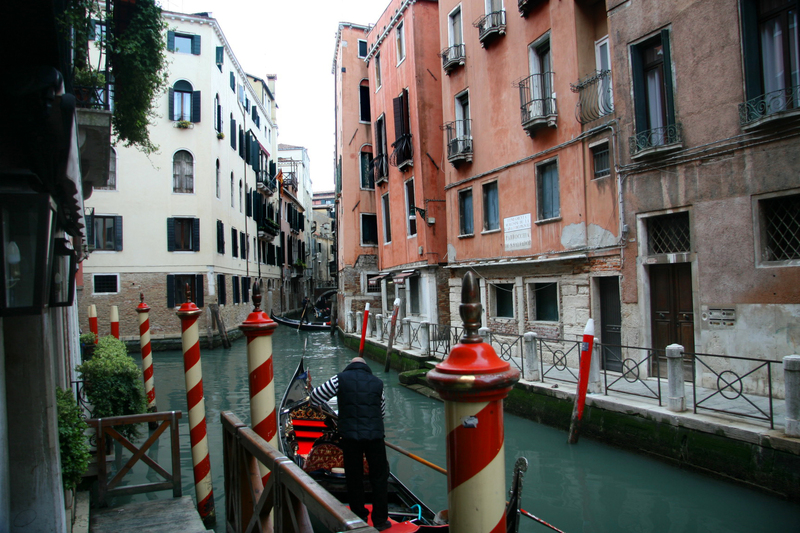 Something that I was more than absolutely keen on doing while in Venice was going on a gondola ride. However, I initially ran into a problem. The city had (and has) set a fixed starting price for a regular gondola ride (80 Euros), and this was definitely out of my budget-travel price range. After doing some research online, I found a few companies that offer gondola rides for a lower price (without undermining the city’s fixed rate). Here’s how it works: a typical gondola can hold up to 6 people. When you buy a ride on the spot, even if there are just two of you, you have to pay for the whole gondola not just your seat out of 6. 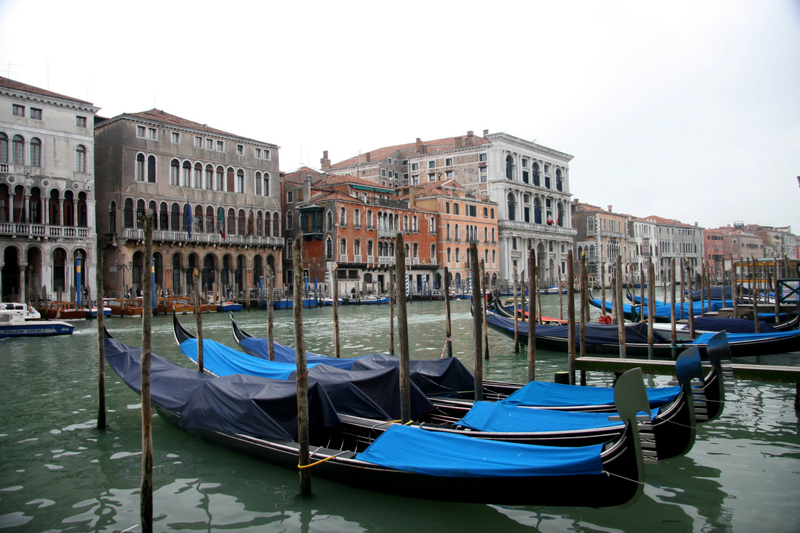 Some (Venetian) tourism companies allow you to book a “seat” on a gondola ride for a lower rate. For instance, I paid around 26 euros for mine. You often have to book through the company online (and in advance), and the company will tell you where and when you need to show up (within the city). There, they will place everyone into groups of 6 for gondola rides. In a nutshell, the company helps travellers split the cost of the rides with others. I booked my gondola ride through viator.com (affiliated with TripAdvisor) and had a fantastic time. However, if you feel inclined to gather 6 people on your own, go ahead because you can easily split the cost of the ride amongst yourselves and possibly pay even less. I have to wrap this post up as I seem to have written more about Venice than minutes I spent in the city, but there just seems to be an endless amount of amazing things to share. If you have an questions, comments, or experiences, please feel free to share! I would love hear from you, since I hope to visit this city again one day. Finally, cheers and huge thanks to the employee of a juice cocktail bar who gave me a free sample of the day’s special on my way back to the train station! Thank you! And I really like the layout of your blog and overall style. I totally agree. There were countless museums I still wanted to visit. Glass-blowing. Explore the smaller islands…this list goes on. I will have to go again someday. Beautiful pictures and good commentary about Venice. I visited Venice many years ago, more than 30 years ago .. sheesh! I spent 3 days there and loved every minute of the stay. I stayed at a campground, which kept the cost down. As many have before me, I paid way too much for a gondola ride. At that time, you could negotiate the price for a gondola ride. I didn’t know that and paid what was asked. I like knowing that you can book ahead and save money on a gondola ride. Thank you for leaving a comment on my 1000 Islands blog post and for following my blog, The Beauty Around Us. I am following your blog as well. Thank you so much for your lovely comment! I’ve that staying at a camp ground – to this day – is a very popular thing to do in order to keep accommodation costs down. This is something I will definitely consider doing if I visit Venice again for a longer period of time. Thanks so much for info! I am visiting Milan and Venice in a few days so this is definitely a good read for me! Well written and beautiful pictures! Thank you so much! 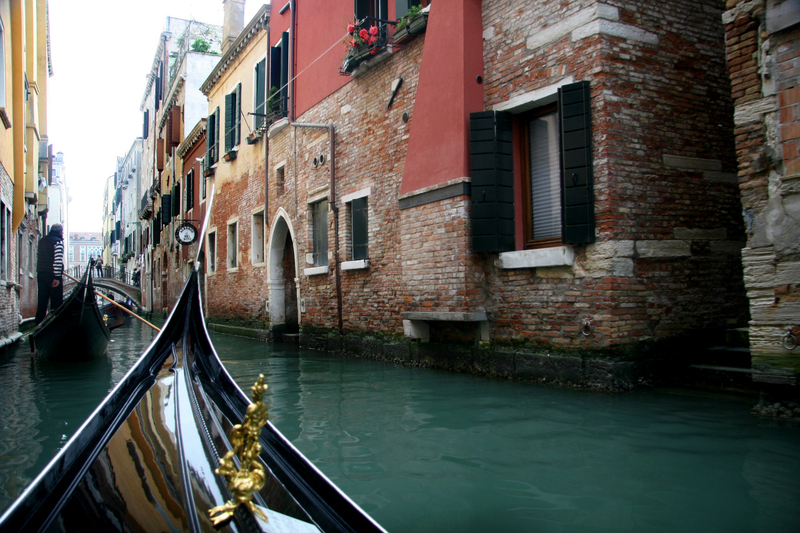 Venice is stunning – I hope you have a great time! It really is one mesmerizing city!